Prepare and serve your delicious onion soups in one bowl! This ceramic onion soup bowl from Browne Foodservice is beautifully designed with a pristine white finish and can go from the oven to the tabletop in no time. 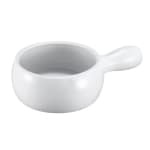 This ceramic onion soup bowl features a side handle for easy and safe serving and has a 18 ounce capacity. This ceramic onion soup bowl is dishwasher safe and oven safe up to 350 degrees! If you have onion soup on the menu then this bowl is a great investment for your restaurant! "This is the best product for making Onion soup"
"Perfectly packaged and delivered on time!" "Gave as a gift. Worked great and will use often." Crock/South Bowls were a hit!